What Effect Did the California Drought Have on Butterflies? Remember the California drought of 2011 to 2015? What effect did that have on butterflies? Newly published research examining more than four decades of data collected in central California by Art Shapiro, UC Davis distinguished professor of evolution and ecology, clearly reveals the effect: a marked difference between how butterfly populations fared at low and high elevations. It's basically good news for the valley or low-elevation butterflies and bad news for the mountain or high-elevation butterflies. The research, "Impacts of Millennium Drought on Butterfly Faunal Dynamics," is published in the journal Climatic Change Responses. Lead author Matthew Forister, a biology professor at the University of Nevada, Reno, is a former Ph.D. student of Art Shapiro's, as are two co-authors James Fordyce of the University of Tennessee, Knoxville, and Chris Nice of Texas State University, San Marcos. UC Davis co-authors, besides Shapiro, are James Thorne and David Waetjen of the UC Davis Department of Environmental Science and Policy. 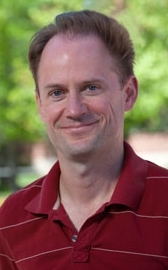 Lead author Matt Forister, a biology professor at the University of Nevada, is a former Ph.D. student of Art Shapiro's. The scientists analyzed such data as first flight, species richness, and diversity. They found that the "dates of first flight advanced across the elevational gradient during the drought, leading to an overall expansion of the flight window at low elevations and a compression of the flight windows in the mountains. The number of species observed per year increased at lower elevations but decreased at high elevations, apparently as a consequence of extreme sensitivity to hot and dry climates." Of the research paper, Professor Shapiro said: "This is the most important contribution from our research group in a while. It documents the responses of entire butterfly faunas to the recent California drought. It demonstrates that, counter to intuition, butterfly faunas near sea level apparently benefited from the drought, temporarily reversing long-term declines, while montane Sierran faunas were severely harmed...the study has broader implications for the biological impacts of climate change." Bottom line: Climate change, aka global warming, is real. Wikipedia describes it as "the observed century-scale rise in the average temperature of the Earth's climate system and its related effects. Multiple lines of scientific evidence show that the climate system is warming." Indeed, we should all be concerned with the increasing severity and frequency of extreme weather events, such as drought, and the challenges that plant and animal life face. "Despite ongoing political controversy swirling around climate change, the vast majority of scientists dealing with the subject have no doubt that it is occurring and that its ecological implications are profound," Shapiro told us today. "One way to address potential long-term impacts of climate change on living things is to examine in detail how they are reacting to shorter-term climatic events, especially climatic extremes. 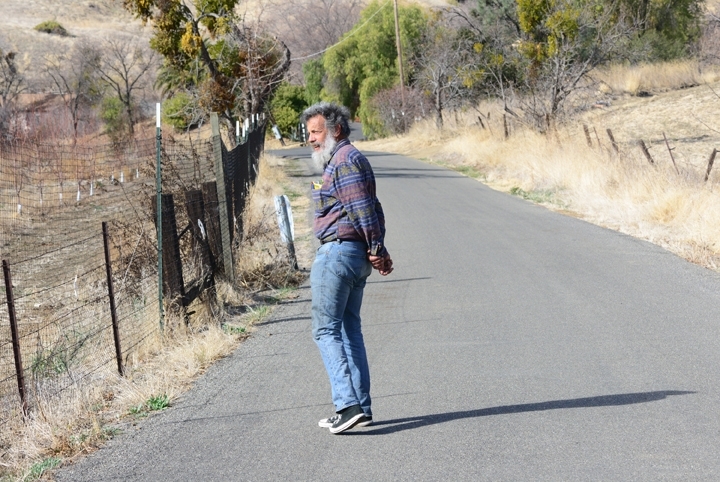 The recent 'millennia'-scale California drought affords just such an opportunity. We have been monitoring entire butterfly faunas along the I-80 corridor in California for many years (in some cases way back to the early 1970s), so we have a huge baseline for comparison to data from the drought years. There are very few comparably continuous and extensive data sets on any group of organisms world-wide. As we explain, butterflies reacted to the drought in mostly unexpected and 'counterintuitive' ways. By trying to understand those reactions, we can approach longer-term trends in a much more sophisticated way. Or so we think." Read the research paper here and learn how the scientists compiled the statistics and obtained the results. 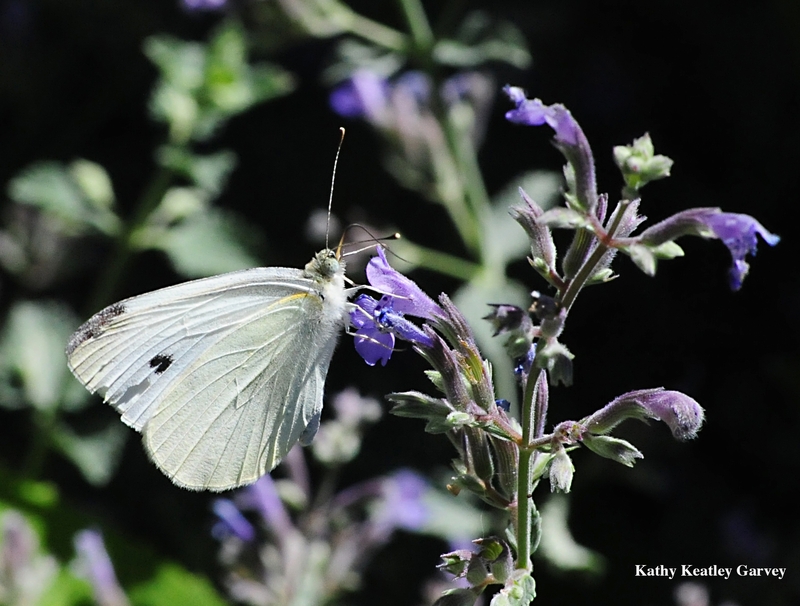 If you're out and about on Jan. 1, start looking for that cabbage white butterfly. But you're going to have to beat the sponsor, noted butterfly expert Art Shapiro, UC Davis distinguished professor of evolution and ecology. Shapiro is offering a pitcher of beer (or its equivalent) for the first cabbage white butterfly (Pieris rapae) collected in 2017 in the three-county area of Sacramento, Yolo and Solano. 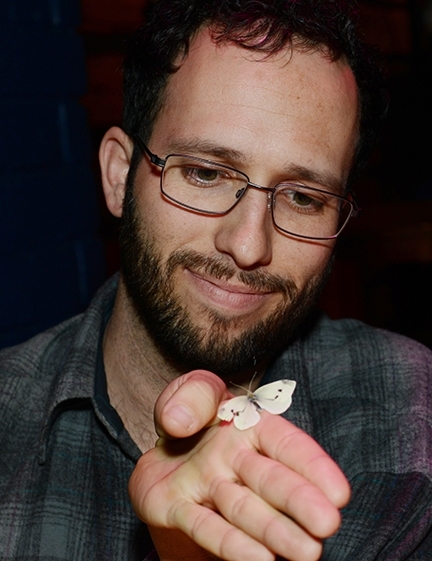 The 2016 winner was UC Davis ecology graduate student Jacob Montgomery who caught a female cabbage white butterfly on Jan. 16 on his lavender plant just outside his front door in west Davis, Yolo County. The 2016 prize winner probably eclosed or hatched around 7:30 that morning, said Shapiro, who has earlier predicted that the first butterfly of 2016 would be collected in mid-January. 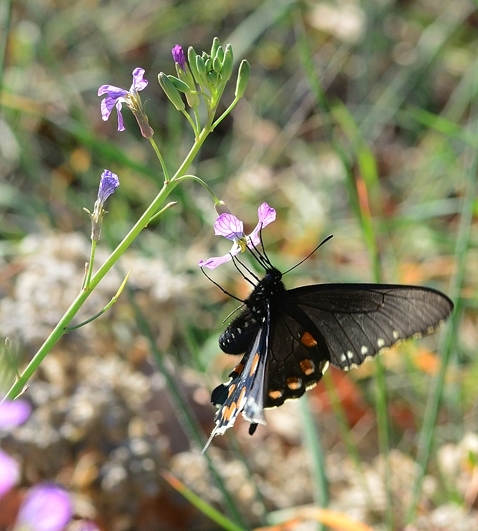 The butterfly is emerging earlier and earlier as the regional climate has warmed, said Shapiro, who does long-term studies of butterfly life cycles and climate. "Such studies are especially important to help us understand biological responses to climate change. The cabbage white is now emerging a week or so earlier on average than it did 30 years ago here." The professor, a fellow of the American Association for the Advancement of Science, the Royal Entomological Society and the California Academy of Sciences, said the cabbage white butterfly inhabits vacant lots, fields and gardens where its host plants, weedy mustards, grow. What does it look like? 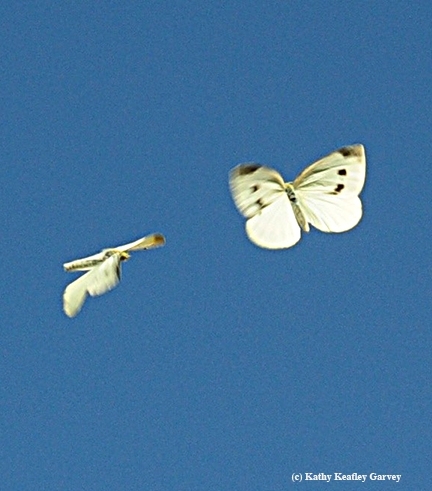 It's a white butterfly with black dots on the upperside (which may be faint or not visible in the early season). It inhabits vacant lots, fields and gardens where its host plants, weedy mustards, grow. It must be an adult (no caterpillars or pupae) and be captured outdoors. Shapiro is the sole judge. Shapiro, who is in the field more than 200 days of the year, monitoring butterflies of central California, knows where to find the cabbage whites and usually returns to his office with the first cabbage white of the year. He has been defeated only four times since 1972. Three winners were his own graduate students: Adam Porter defeated him in 1983; and Sherri Graves and Rick VanBuskirk each won in the late 1990s. Shapiro has collected many of his winners in mustard patches near railroad tracks in West Sacramento, Yolo County. Over the last seven years, five of the winners came from West Sacramento; one in Davis, Yolo County; and one in Suisun, Solano County. 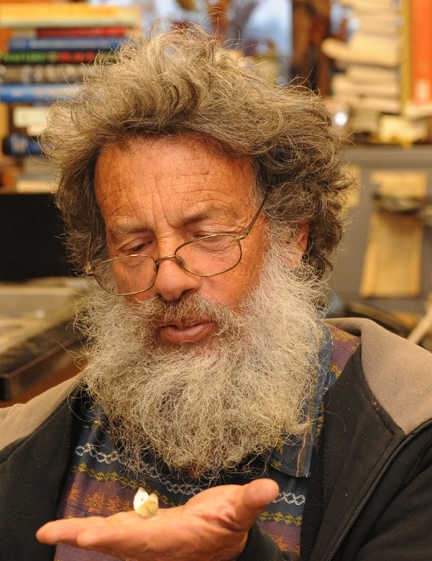 Shapiro maintains a website on butterflies at http://butterfly.ucdavis.edu/, where he records the population trends he monitors in Central California. He and artist Tim Manolis co-authored A Field Guide to Butterflies of the San Francisco Bay and Sacramento Valley Regions, published in 2007 by the University of California Press.